DIN ISO 7619, DIN EN ISO 868, NF EN ISO 868, ASTM D 2240 (DIN 53505). Our range of Shore Durometer - HP Series Durometers are suitable for accurate hardness measurement of all natural and synthetic rubber products, plastics, acrylic glass, acetates, casting resin, polyester, thermoplastics, PVC, neoprenes, hardboards, wood, leather, and fruits within the Shore Shore A, A0, B, 0, C, D, D0, 00, 000, 000S, E, Qualitest Variant C (Asker C), L/c. 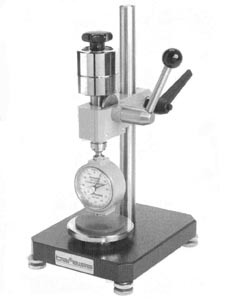 These durometers are the highest precision models on the market with very easy handling. HP Durometers can be used as portable instruments and together with our test stands as bench-top units. All of our analog durometers have a round, clearly arranged and antiglare scale. The scale's graduation is always 0 – 100 shore, divided in 100 units. 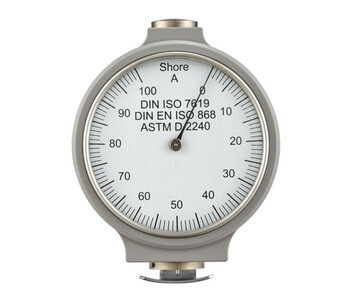 The most important advantage of these handy analog durometers is the absolute precise indication of their measured values, due to the unique design and sophisticated engineering applied in the spring mechanism. The entire chassis of HP is made of aluminum which provides light weight and durability. Generally durometers are recommended to undergo annual calibration, however again due the excellent spring design and mechanism of HP durometers, these units will maintain their calibrations and accuracy within the ranges for a few years. Our durometer line is optionally available with a maximum indicating pointer (models ending with "S"). This feature makes the maximum value easier to read and allows the determination of the flow characteristics of the material after a certain test time. The type A durometer, combined with the screw-on loading weight according to ASTM D 2240 and DIN 53505, guarantees a constant measuring result. BS 61 Test Stand is an ideal accessory to be used with our Shore Durometer - HP Series Durometer for higher volume bench-top measurements. The pick-up device allows a quick and easy mounting of the durometer. The built-in loading device for hardness tests within Shore A range, guarantees a constant pressure as prescribed in DIN 53505. For range D hardness tests, an additional loading weight, conforming to standards, is placed onto the integrated loading device. The hardness results can be measured without subjective influences because of this constant load. We also offer digital durometers, the highest accuracy that can be found on the market.